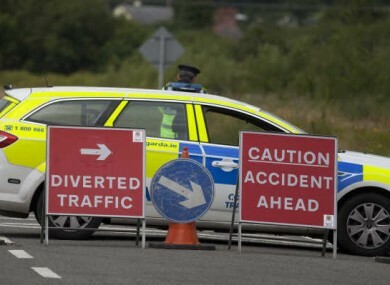 One third of fatal Irish road crashes were caused by speed. ONE IN THREE fatal road crashes were caused by speed between 2008 and 2012 – making it a much bigger factor in fatal collisions than previously thought. Donegal, Cork, Wexford, Cavan and Galway had the highest rates of speed-related fatal road accidents, according to the report launched by the Road Safety Authority (RSA) today. And 91% of culpable drivers were male. The report shows speed could account for twice as many fatal road accidents in Ireland than previously thought. Liz O’Donnell, RSA chairperson, said previous research based on preliminary garda crash scene reports estimated that excessive speed was a factor in 15% of fatal collisions. “[This] shows that excessive speed plays a more significant role in collisions on our roads, accounting for one in three fatal collisions analysed between 2008 and 2012,” she said. The faster you drive, the more likely you are to kill or seriously injure yourself or someone else if you are involved in a collision. Slow down – drive at a speed that is appropriate to the conditions and your experience, and remember a speed limit is not a target. Over the four year period, 322 people died on Irish roads in collisions where speed was a contributory factor and 74 people were seriously injured. Of the 322 people killed: 158 were drivers, 49 were motorcyclists and 100 were passengers. 84% of drivers involved in a single vehicle collision were under 34 years of age and weekends were a high risk period for speed-related collisions. The RSA’s Annual Road Safety Conference is examining the use of Intelligent Speed Assistance (ISA) to reduce speed on our roads. Professor Oliver Carsten, of the University of Leeds, said the technology has the potential to reduce collisions by 30% and reduce deaths by 20%. ISA uses a video camera that recognises speed signs and a GPS system to advise drivers of the current speed limit. The most advanced systems can automatically limit the speed of the vehicle. However, the driver is still able to override the system. Email “91% of culpable drivers in car crashes caused by speed were men”. Feedback on “91% of culpable drivers in car crashes caused by speed were men”.